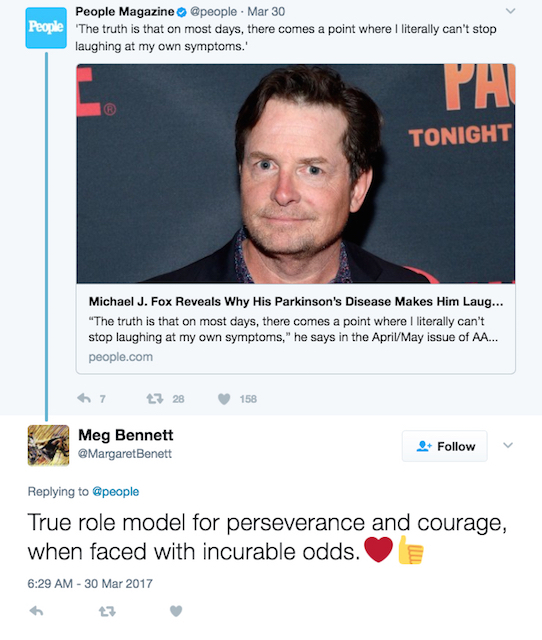 Social media users have praised Michael J Fox after he confessed he “can’t stop laughing” at his Parkinson’s symptoms. The star, who has been living with the condition for 26 years, opened up about the challenge posed by everyday activities such as making a cup of coffee – and how he uses humour to overcome frustrating situations. 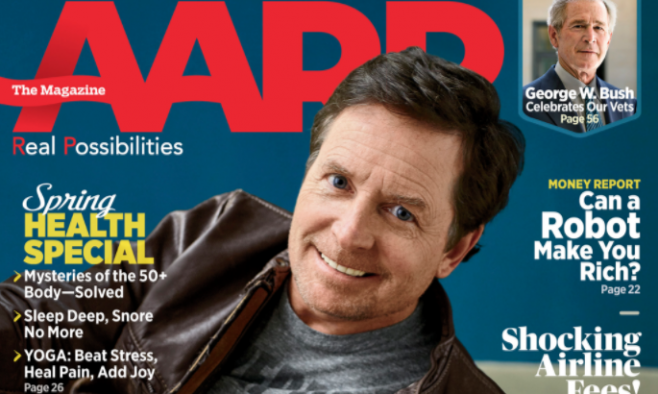 The actor-turned-campaigner made the comments during a wide-ranging interview in the latest edition of US-based AARP The Magazine. The MJ Fox Foundation said the article – which was followed up by media outlets across the world – was timed to coincide with Parkinson’s Awareness Month in April. His remarks prompted an outpouring of emotion from social media users – including people with Parkinson’s – who praised the actor for his honesty and bravery. Meg Bennet said Fox was a “true role model”. MJ Olson was inspired by the fact that Fox hasn’t allowed Parkinson’s to keep him out of the public eye. @MichaelJFoxOrg @realmikefox @people I can't tell you how much it means to me that you haven't retreated from the public eye due to Parkinson's. You will always be fabulous! Parkinson’s blogger Bruce Ballard said that while – like many – he had enjoyed reading about how Fox was coping on a personal level, his “favourite” part of the interview was when the actor turned his attention to political issues affecting Parkinson’s treatment. “He remains politically active, which is especially crucial in the current scary, haunted house (haunted White House) zeitgeist,” said Ballard. In February, as part of the Foundation’s 2017 Parkinson’s Policy Forum, Fox joined more than 200 Parkinson’s advocates on Capitol Hill to meet with lawmakers and discuss access to care issues affecting the PD community. The Michael J Fox Foundation for Parkinson’s Research, which was founded in 2000, has raised more than $700 million to help find a cure for the condition.